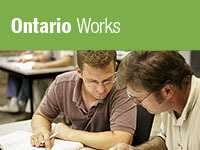 The application process is completed in person at your local Ontario Works office. You will be required to complete and sign all necessary forms, including the application for assistance, and a participation agreement outlining the specific employment activities that support your best route to sustainable employment. You will also need to provide any required information and documents. the application process over the phone. 3. If you are close to one of the office locations below it can be dropped off at the front desk for processing. Please be aware that the Noëlville office is not staffed and if you are in the Sudbury East area you would have to drop it off at the Warren office. Once your application is received it will be forwarded to the Case Manager for your area after which an appointment will be scheduled to see a Case Manager with 4 business days. If you live outside the Manitoulin-Sudbury District area and require assistance please locate the District Services Board for your area by clicking HERE. If you would like your child to participate in a recreation program this season, and require assistance with the registration fee or equipment, please complete the Our Kids Count Self-Application and return to the DSB office nearest you. Maximum of $400 per child per year. Pour la version française, appuyez-ici. If you're trying to move off of Ontario Works, and need temporary assistance with your child care costs, the DSB provides informal child care in areas where licensed care has not been established. Please complete the Our Kids Count Self-Application and return to the DSB office nearest you. Pour la version française, appuyez-ici. If you require assistance with purchasing items such as car seats, cribs and beds, please complete the Our Kids Count Self-Application and return to the DSB office nearest you. Maximum of $300 per child per year Pour la version française, appuyez-ici. We can also assist with emergency needs such as formula and diapers. Through this fund we can help you with short-term one-time assistance for such things as hydro arrears or disconnection, rental arrears to avoid eviction as well as other emergency situations. Please complete the Healthy Communities Application and return it to the DSB office nearest you. If you wish to apply for Social Housing please complete the Housing Application Form and return it to the DSB office nearest you. This form must be printed and signed before submitting. If you are receiving Ontario Works and have children living with you and have rent costs over your maximum shelter allowance through Ontario Works you may qualify for Direct Shelter Subsidy. You must apply for Social Housing in order to qualify for this program. Applying for Social Housing does not necessarily mean you will have to move to a unit should it become available. Please complete the Direct Shelter Subsidy and return it to the DSB nearest you. If you are working, going to school or your child requires day care for socialization you may qualify for a full or partial subsidy with a licensed daycare provider. Please complete the Child Care Application (English) (French) and return it to the DSB nearest you.